More than a third of Illinois’ colleges and universities allow a large number of students who have no proof of being vaccinated for measles to live on their campuses, a long-standing pattern NBC 5 Investigates has discovered. In 2015 alone, more than half of Illinois’ higher-education campuses allow non-immunized students at rates considered risky by most health officials. With 15 people diagnosed with measles this year in the Chicago area – including a student at Elgin Community College – NBC 5 Investigates examined the vaccination rates for the group of people who are probably closest to one another all day (and all night as well): Full-time, residential students at the 36 public and private colleges and universities in Illinois where students can live on campus. The risks can be real when it comes to immunizations. Nine students came down with the mumps at the University of Illinois last year. In previous years there were similar outbreaks at college campuses in California, Virginia, and Maryland. At Princeton University in New Jersey, six students contracted bacterial meningitis in 2013. But currently, on 13 Illinois campuses, state records show that five-percent or more of the students currently living there have not been vaccinated for measles, a similarly contagious virus. At five additional schools, the rate jumps to more than 10 percent. And at two universities – Concordia and The School of the Art Institute – more than one in every four students who live on campus are not protected from measles, according to state records. Illinois law says that all residential college students are supposed to provide proof of immunity against a variety of diseases – measles, mumps, rubella, and whooping cough – in order to enroll in school. As an alternative, they can apply for an exemption on either medical or religious grounds. The law says everyone else "shall be precluded from enrolling at that institution in a subsequent term." The law also says every college must report their immunization figures to the state, every year. NBC 5 Investigates analyzed the yearly college immunization reports for measles that were filed with the Illinois Department of Public Health for the past six years. As a rule, the U.S. Centers for Disease Control says a school should keep the number of non-immunized students below 10 percent. But many doctors point to the "herd immunity" threshold for measles – about 95 percent – as the rate of people who need to be vaccinated in order to protect those who can’t be [usually because of medical conditions – especially during an outbreak. That would keep the rate of non-immunized students below 5 percent. Many Illinois schools make sure their students are immunized. Lake Forest College, for example, has kept its level of non-vaccinated students below two percent for most of the last six years. Illinois Wesleyan University in Bloomington consistently keeps its non-protected students at three percent or below. But fourteen colleges and universities have a pattern of reporting high rates of students who have not been immunized for measles – 10 percent or more – for most, if not all, of the past six years. Take Concordia University in west-suburban River Forest: It consistently reports to the IDPH that anywhere from 23 percent to 31 percent of its on-campus students are not protected from measles. 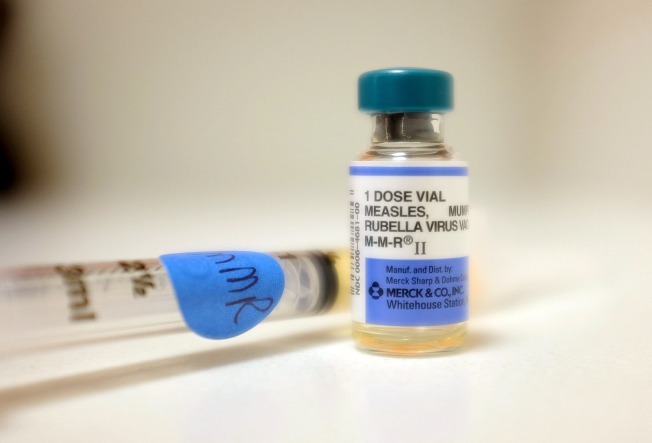 Lombard-based National University of Health Sciences’ annual rate of students who are vulnerable to measles has ranged from 19 percent all the way up to 51 percent. The School of The Art Institute, Dominican University, and The University of Illinois at Springfield have also reported high rates of unprotected students, every year. In a statement, a spokeswoman at the School of The Art Institute told NBC 5: "It is our belief that most students have received their immunization and simply have not submitted their immunization records." She said the school has taken steps to provide free vaccinations, and that they’ve removed 300 students from their non-immunized lists since the state report was filed. The University of Illinois at Springfield has a high number of transfer and graduate students, according a spokesman there, though he adds that they would need to investigate more to see if that’s a cause of their higher rate of unprotected students. None of the other schools with high rates of non-vaccinated students responded to NBC 5 Investigates’ request for comment. Two schools – Columbia College and (again) the University of Illinois at Springfield – have not reported their current vaccination figures to the state, in apparent violation of state rules. The UIS spokesman said their omission may be due to a database conversion, and they’re looking into it. At Columbia, a spokesman said their immunization report was delayed "because of circumstances beyond our control," but said they take the report seriously and do plan on filing it. It is important to remember that these reports just reflect pure numbers. Because of privacy laws, there is no way for a student to find out if his or her roommates have gotten vaccinated for measles (or any other disease) unless they volunteer that fact.